So, I'm a sucker for a good wall calendar. I'm also horribly cheap, which means I usually buy my calendars sometime in February. What a bargain! It used to be I would go to Borders, a mile up the road, right after Christmas and snag my fill of numbered days. Then Borders died. (sigh) I'm still not over the death of Borders. I'm not wild about the Fast and Furious Barnes & Noble up the road, despite them having a Starbucks that's open until 11 pm. The parking lot is a gathering spot for local street racers, hence the unofficial name (at least in my mind), so there's a sea of spoilered Honda Civics in the lot all night, and a crowd that seems particularly disinterested in purchasing printed paper. It's not my scene. If Vin Diesel shows up with zen thoughts and a kitten for us all to pet, I'll revise my opinion. Now, I buy my calendars online, and I've learned that year-round calendar purveyors do not have the mad post-holiday sales of a brick-and-mortar bookstore. I'm a fan of RetailMeNot, and Ms. Cheapskate can usually find a coupon code or two that makes a paltry new year discount more palatable. Those suckers don't show up until February or so, though, so I stagger through January without a page to scribble on, and then get something pinned to the wall. Yes, I am a Luddite when it comes to counting my weeks and months. I'm fine with that. There's something about turning a page, seeing a beautiful image or thoughtful words heralding a clean slate of days, and, maybe a number outlined in Sharpie, reminding me of a loved one's birthday or a vacation day, or—importantly—pay day. Those days are treasured for their ability to keep me housed and fed and my pencil case filled and the Internet and coffee perking. I have them outlined in green. 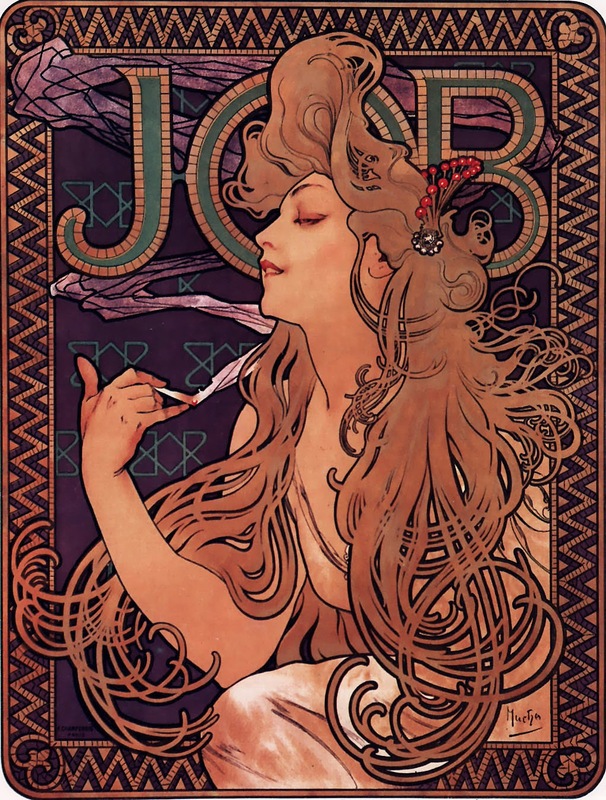 This year's calendar is a festival of Art Nouveau lushness in the form of twelve Alphonse Mucha beauties. As a kid, I used to love the Job rolling paper poster one of my sisters had in her room. I had no clue of the weed paraphernalia significance of the rolling paper ad back then. I was too young, and I was just captivated by the gorgeous woman on the slick paper, smoke curling around her fingers and head, a look of some sort of out of body experience across her face. The Art Nouveau revival of the 1970s certainly helped form my taste in art, but it would take me decades to realize it. I'll never have a real Mucha of my own (unless I win the lottery—enough F-U money can turn anyone into a gen-u-ine art collector), so I'm willing to settle for fridge magnets and wall calendars. And, in February, I got my bevy of twelve beauties to pin to my wall at work. They are gorgeous and even have a little glitter going on, which actually amuses me, a definitively non-glitter girl. anticipated being Leonardo DiCaprio and not Kate Winslet on that damn door), maybe it was another project postponed or cancelled, maybe it was just a need to blow off steam... I don't recall now. 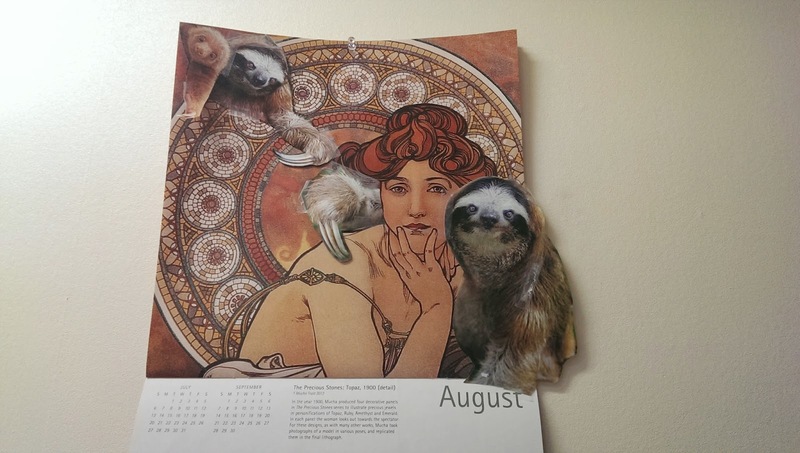 I just know I had a compulsion to cut out all the sloth photos in the magazine, pull out the Scotch tape, and and affix those happy fuzzballs to my Mucha calendar. I giggled like an idiot as I did it. Someone walked past my door and gave me this "she's lost it" look. I didn't care. God knows we all need relief valves in this life, and if mine could be gently turned with tape and scissors, that's a good thing. Trust me, I commute to work by car in DC. At least I wasn't yelling at anyone. 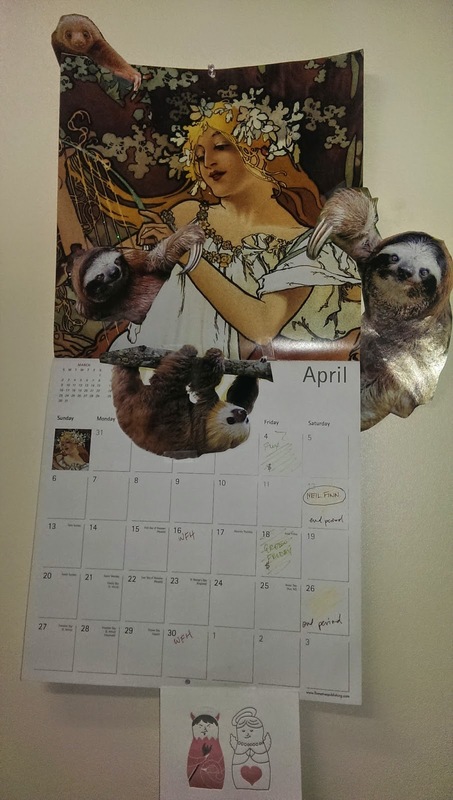 Miss April was the first Mucha girl to get slothinized. 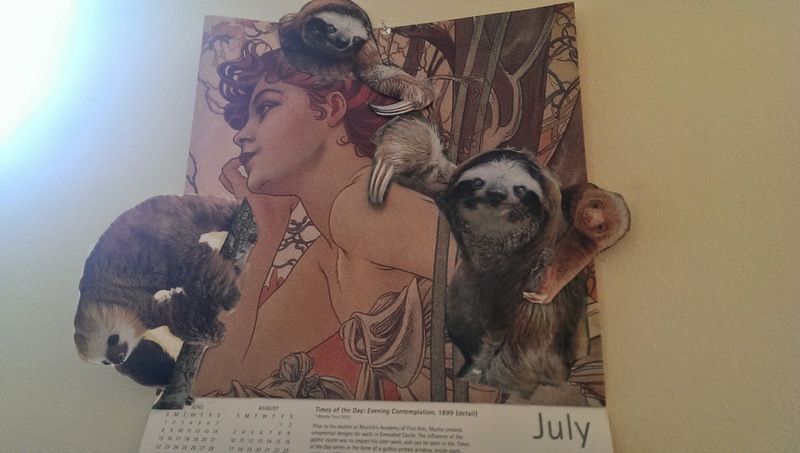 Since then, I've gingerly removed the same four sloths from one month and moved them to the next. They've been torn and repaired and even had limbs removed to suit my Frankensteinish requirements. They make me smile. It's so stupid, but at least once a month, I have five minutes at my desk to do something that doesn't cause stress or require me to ponder the future beyond 30 or so glittery days. I've tried to snap a cell phone photo of each month since April, but somehow I managed to miss a couple of months, alas. 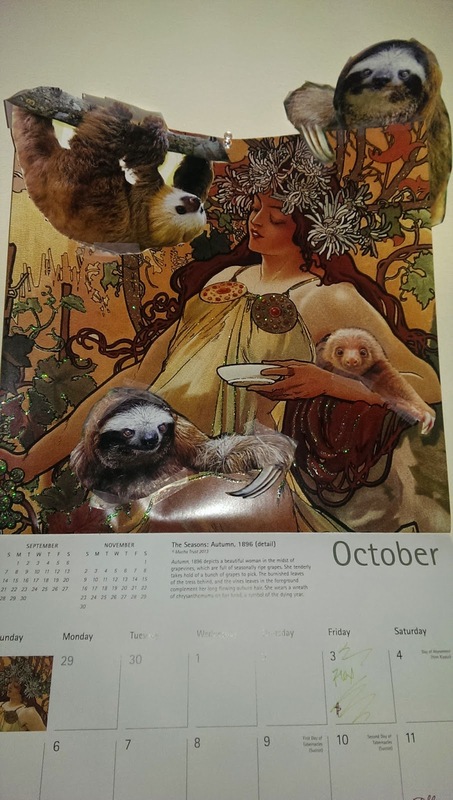 So, for your amusement, I offer a selection of the Mucha Sloth Nouveau Tableaux 2014. Miss April had the added bonus of a little letterpress angel and devil. 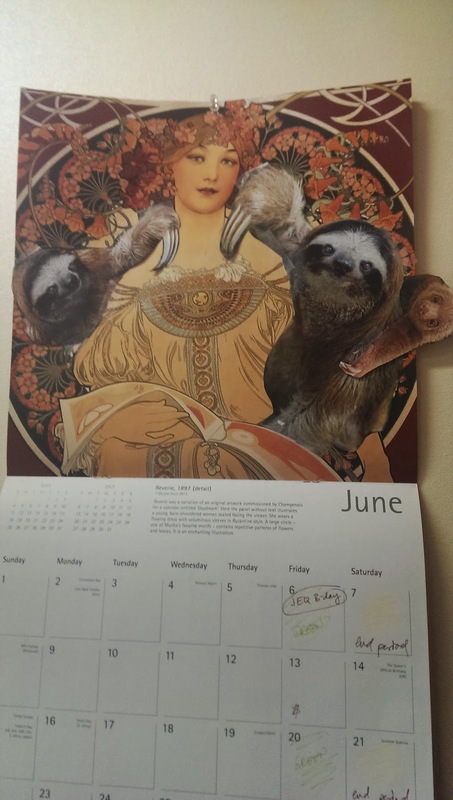 June only sported three sloths up top. The tree hanger dude is off screen at the bottom. July got a little chummy with that guy hanging off her shoulder. "We cool. We cool." August saw "chummy" become a little more intimate. He's makin' moves. October took a total "harvest cornucopia of sloth" turn. All hail autumn and her crop of sloth! Next comes November, and the sloths will turn on my birthday. I may have to add a hand turkey into the mix. We shall see. I'll get some construction paper and make them all Santa hats for December. What happens come the new year? Still to be determined. Not sure where my calendar will hang come 2015. Nor do I know if the sloths (a new, less battered batch) will still be cavorting with the lovelies of Mucha's hand or another artist altogether. I'm accepting suggestions. Glitter optional. Nicely done! This was a good way to start my morning. Thanks. Thank you. :) Tried to thank you yesterday, but Blogger was not cooperating.